Mina Murray and her friend - Lucy Westenra - have traveled to the town of Whitby in North Yorkshire, England. Situated at the mouth of the Esk River, along the eastern coast of the county, Whitby is a quaint town which features the ruins of St. Hilda's (an old abbey) on the town's East Cliff. Something very strange is going on with Mina Murray's friend, Lucy Westenra. She is sleepwalking, more than usual, and in very strange places. On the night of August 11th, Mina woke-up to find Lucy missing from her bed. The door was open. Where could she have gone? Hear the story - and learn about the strange markings on Lucy's neck - as Carole Bos, creator of Awesome Stories, reads sections of Chapter 8 from Bram Stoker's Dracula. I took a big, heavy shawl and ran out. The clock was striking one as I was in the Crescent, and there was not a soul in sight. I ran along the North Terrace, but could see no sign of the white figure which I expected. At the end of the West Cliff above the pier I looked across the harbour to the East Cliff[where the old Abbey is located], in the hope or fear, I don't know which, of seeing Lucy in our favourite seat. 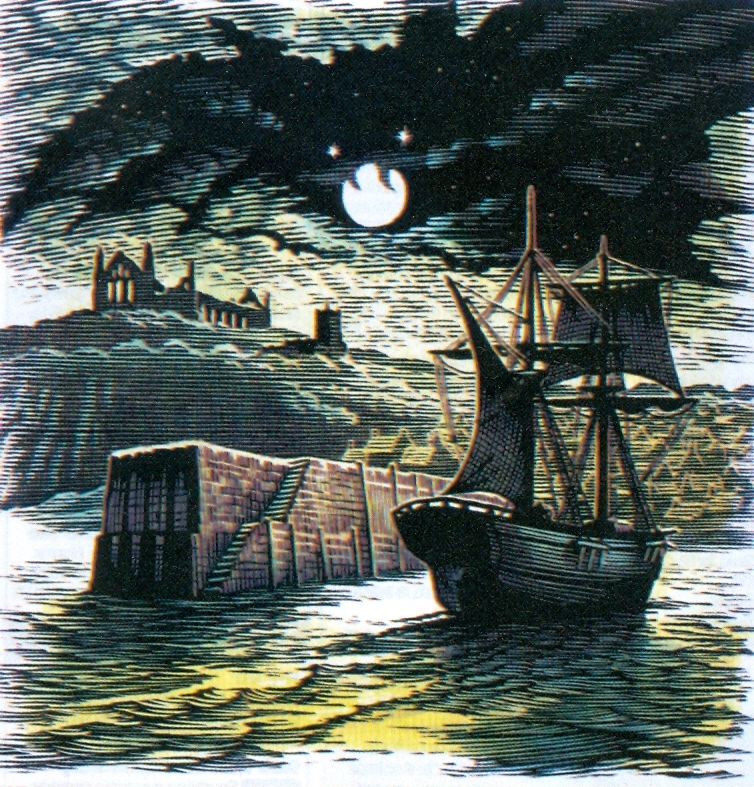 There was a bright full moon, with heavy black, driving clouds, which threw the whole scene into a fleeting diorama of light and shade as they sailed across. For a moment or two I could see nothing, as the shadow of a cloud obscured St. Mary's Church and all around it. Then as the cloud passed I could see the ruins of the abbey coming into view, and as the edge of a narrow band of light as sharp as a sword-cut moved along, the church and churchyard became gradually visible. Whatever my expectation was, it was not disappointed, for there, on our favourite seat, the silver light of the moon struck a half-reclining figure, snowy white. The coming of the cloud was too quick for me to see much, for shadow shut down on light almost immediately, but it seemed to me as though something dark stood behind the seat where the white figure shone, and bent over it. What it was, whether man or beast, I could not tell. I did not wait to catch another glance, but flew down the steep steps to the pier and along by the fish-market to the bridge, which was the only way to reach the East Cliff. The town seemed as dead, for not a soul did I see. I rejoiced that it was so, for I wanted no witness of poor Lucy's condition. The time and distance seemed endless, and my knees trembled and my breath came laboured as I toiled up the endless steps to the abbey. I must have gone fast, and yet it seemed to me as if my feet were weighted with lead, and as though every joint in my body were rusty. When I bent over her I could see that she was still asleep. Her lips were parted, and she was breathing, not softly as usual with her, but in long, heavy gasps, as though striving to get her lungs full at every breath. As I came close, she put up her hand in her sleep and pulled the collar of her nightdress close around her, as though she felt the cold. I flung the warm shawl over her, and drew the edges tight around her neck, for I dreaded lest she should get some deadly chill from the night air, unclad as she was. Same day, noon. - All goes well. Lucy slept till I woke her and seemed not to have even changed her side. The adventure of the night does not seem to have harmed her, on the contrary, it has benefitted her, for she looks better this morning than she has done for weeks. I was sorry to notice that my clumsiness with the safety-pin hurt her. Indeed, it might have been serious, for the skin of her throat was pierced. I must have pinched up a piece of loose skin and have transfixed it, for there are two little red points like pin-pricks, and on the band of her nightdress was a drop of blood. When I apologised and was concerned about it, she laughed and petted me, and said she did not even feel it. Fortunately it cannot leave a scar, as it is so tiny. I walked along the cliffs to the westward, and was full of sweet sadness, for I was thinking of Jonathan. When coming home, it was then bright moonlight, so bright that, though the front of our part of the Crescent was in shadow, everything could be well seen, I threw a glance up at our window, and saw Lucy's head leaning out. I opened my handkerchief and waved it. She did not notice or make any movement whatever. Just then, the moonlight crept round an angle of the building, and the light fell on the window. There distinctly was Lucy with her head lying up against the side of the window sill and her eyes shut. She was fast asleep, and by her, seated on the window sill, was something that looked like a good-sized bird. I was afraid she might get a chill, so I ran upstairs, but as I came into the room she was moving back to her bed, fast asleep, and breathing heavily. She was holding her hand to her throat, as though to protect if from the cold. 17 August. - No diary for two whole days. I have not had the heart to write. Some sort of shadowy pall seems to be coming over our happiness. No news from Jonathan, and Lucy seems to be growing weaker, whilst her mother's hours are numbering to a close. I do not understand Lucy's fading away as she is doing. She eats well and sleeps well, and enjoys the fresh air, but all the time the roses in her cheeks are fading, and she gets weaker and more languid day by day. At night I hear her gasping as if for air. I trust her feeling ill may not be from that unlucky prick of the safety-pin. I looked at her throat just now as she lay asleep, and the tiny wounds seem not to have healed. They are still open, and, if anything, larger than before, and the edges of them are faintly white. They are like little white dots with red centres. Unless they heal within a day or two, I shall insist on the doctor seeing about them. Bram Stoker's Dracula, part of Chapter 8, read by Carole Bos. Bos, Carole "Bram Stoker's Dracula - The Vampire Attacks Lucy - Audio" AwesomeStories.com. Oct 07, 2013. Apr 24, 2019.